A Muscle Cruiser with a Sport Bike Soul. 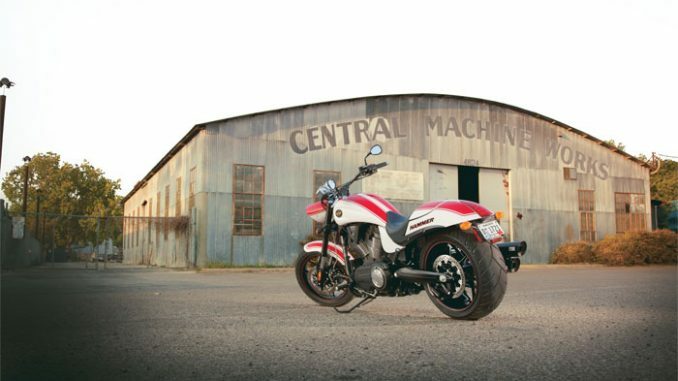 At the intersection of sporty styling and cruiser muscle are the Hammer and Hammer S. Minimal, sporty bodywork highlights the meaty 250mm rear tire and the dual disk brakes up front. The Hammer S is a limited-edition model with special muscle car-inspired styling. Go one-step further than the Hammer with the Hammer S V-Twin cruiser motorcycle wide tire cruiser motorcycle. We take the raw aggression that riders love about the Hammer and push it to another level with the styling on this machine. Blacked out custom detail and exhaust provides a striking contrast to the custom painted wheels and hard-to-miss paint job. Add that to the power of the 106 cubic-inch Freedom V-Twin engine that drives 97 horsepower and 113 ft.-lb. 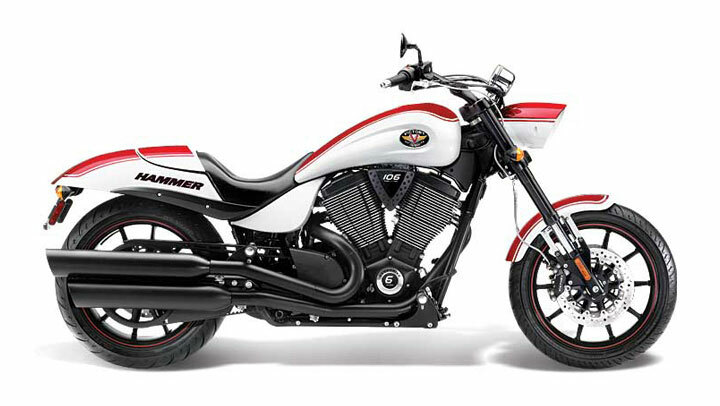 of torque to provide you with an unforgettably powerful ride on an unforgettable bike. 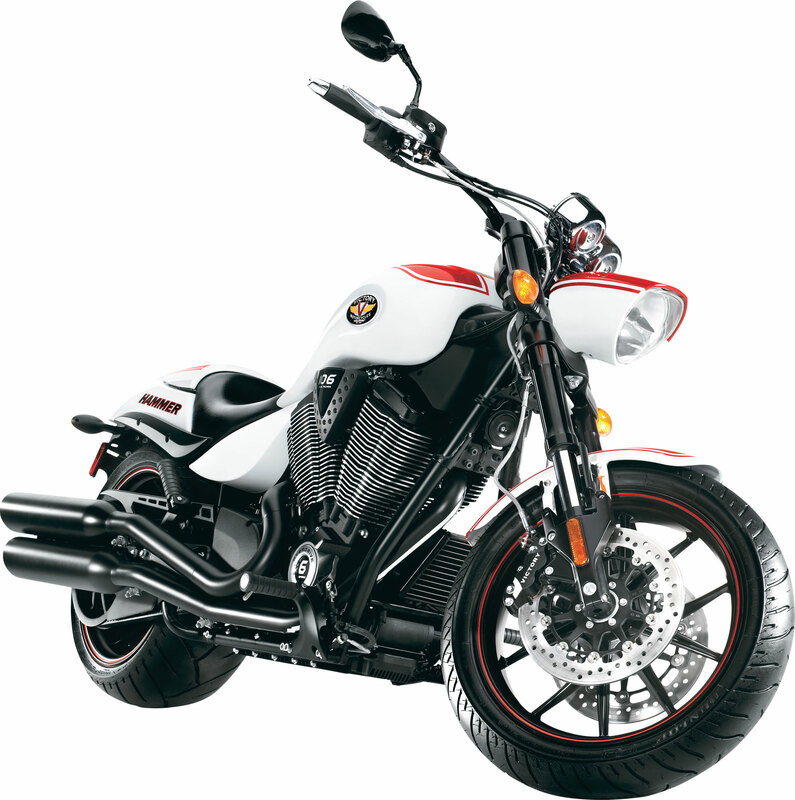 This V-twin cruiser is the height of style and performance. Nobody is going to miss this machine rolling down the highway or the city streets. The style takes the aggression of the Hammer model and steps it up. The suede red and black color scheme with the white stripe immediately brings to mind the muscle cars and cruisers of the past. o In terms of operating sound, selected modulation frequencies have been eliminated. This produces a more-appealing sound – consistently in each gear. In 4th and 6th gears in particular, gear whine has been reduced. o “Neutral Assist” has been added to make it easier for a rider to shift into neutral when stopped. This will reduce the rider’s effort, will reduce clutch wear and will lessen the performance demands on the oil. 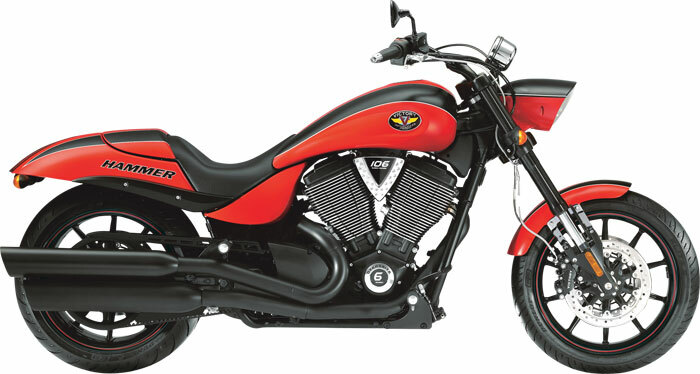 o The triple clamp is black on all models except the Hammer S Jackpot (which retains its chrome triple), and the Victory Cross Roads (which retains its brushed finish). o Sport-styled bodywork, with high rear fender exposing the 250mm rear tire. o Dual front disk brakes and inverted forks. o Colour-matched cowl detaches to reveal passenger seat. o Chrome bracket holds tachometer and new speedometer (which can show MPH or KPH) featuring blue backlighting, indicator lights on the gauge face and large LCD that provides: Clock (viewable at all times), gear position, odometer, trip meter and diagnostic readouts. o Hammer S has new custom styling, as it does each year. oNew X-Bow and Tri-Pro Stage 1 Performance Exhausts. Whether you’re finding your way across town or cruising the city’s glass canyons, the Freedom V-Twin power plant delivers 97 horsepower and 113 ft lbs of green-light torque with ultimate authority. 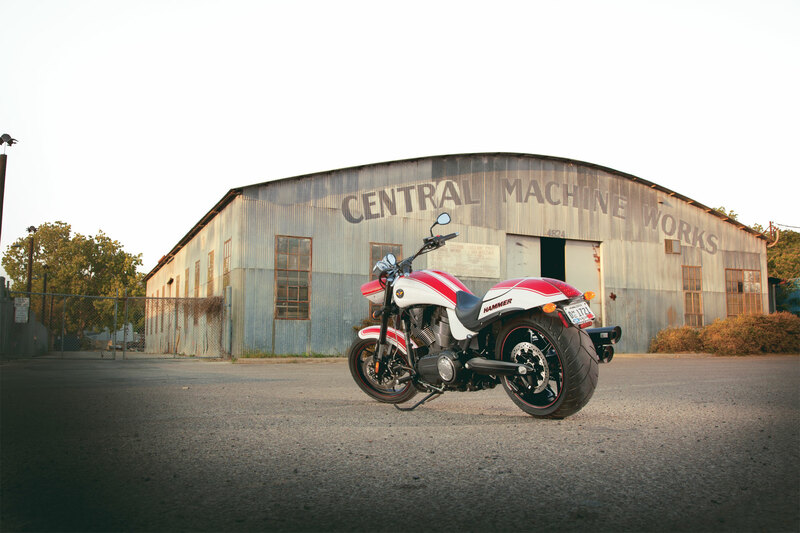 The heart of every Victory Cruiser machine, it informs the world of your arrival with every crack of the throttle. The best performing transmission on the street collects the power generated by the massive V-twin and allows the Hammer S to roll fluidly between the curbs. Helical-cut gears ensure that each shift will be as smooth and clean as the bike itself. Press the starter and you can feel deep in your chest an eruption of low-end torque. 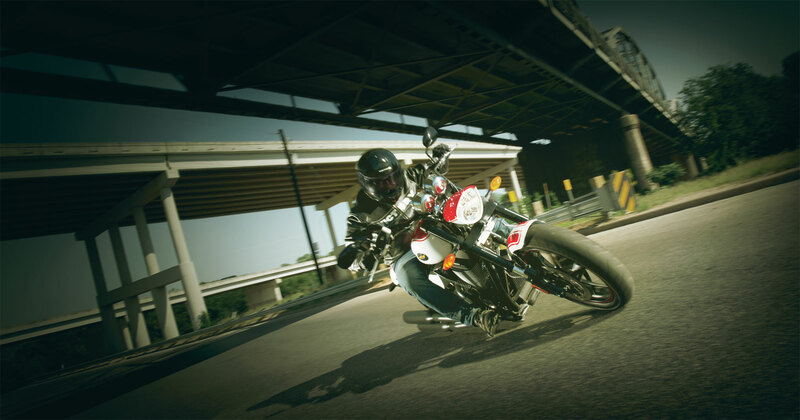 With each precision-tuned piston stroke, the Freedom V-Twin’s 4-valve overhead cams and perfectly matched 6-speed overdrive transmission promise to provide unmatched throttle response, acceleration and passing power. When it comes to muscle cruisers, Hammer S definitely knows its own strength. Three hundred millimeter floating rotors equipped with 4-piston calipers provide the kind of sure-footed stopping that inspires confident riding. The inverted cartridge telescopic fork has 5.1″ of road-smoothing travel, and awards a Hammer S rider with smooth easy steering, in town and on the open road. Put a 250 mm tire on the back of a muscle cruiser like Hammer S, and rider and machine will both look like they are ready for anything the road has to dish out. In this case, looks aren’t deceiving. This tire will stick to the road no matter the condition, and make any rim proud to be associated with it. Even the most independent of riders feels the need for human interaction once and a while. When that time comes, yank the stylish, color-matched cowl and there’s your passenger’s ticket to ride. When ready to get back to that drag bike demeanor, simply reattach the cowl and return to one-up heaven. A sharp looking red wheel stripe reminiscent of racing/muscle car styling makes these custom wheels ideal for the Hammer S. Even while standing still they suggest this is a high performance bike to be reckoned with. Kick the Hammer S into first and there is immediately no doubt .